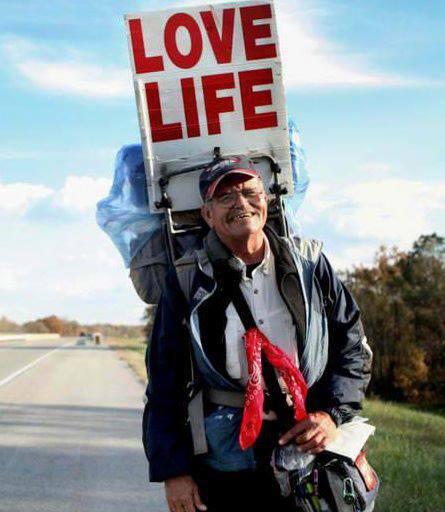 Steve Fugate the original “LOVE LIFE” guy, began his next long distance walk from Vero Beach, Florida March 23rd at 9 AM. Fugate, who is 66 years-old has already logged over 30,000 miles with his LOVE LIFE sign. His motivation to cross the country 6 times in the past rises from tragedy striking his life. Steve lost his son, Stevie, to suicide at the age of 26. Steve’s first walk was in honor of his son. He carried the LOVE LIFE sign in his effort to, as he says “mend the broken heart while still beating”. Six years, and several thousand miles later tragedy struck once again as he was winding up a walk and learned that his daughter who was suffering with MS had died from an accidental overdose. This time he said he had the answer on the sign above his head LOVE LIFE. It’s not always easy to LOVE LIFE, but Steve is proof that if anyone can face the adversity of losing all of one’s children, as he has, and still love life then it’s possible for anyone. Steve is inspired to share the love he would otherwise be sharing with his children with the people he meets, many of whom are deeply distressed either at a loss or are considering giving it all up. That is until they see his LOVE LIFE sign and strike up a conversation. He’s had people tell him that he’s come into their lives in person or interviews just as they were in the act of taking their life. I lost my 28 year old son Steven….. He was found unconscious, in a parking lot, where someone had dumped him to die…..
A major hospital right across the street. He was an organ donor and saved five different lives, and it has been a year, the detectives closed his case, we gave no idea what happened to him. He was not with friends or co workers, he was not driving. Our world has never been this devastating, we dont know how to go on……without him. This is the worst thing in this entire world that could happen to any parent!!!!! this is not a website administrator, but i offer my condolences…i am very saddened by the occurrence of this tragedy in your life. your son can and will never ever be replaced. Hopefully, you receive my response, and and I hope you accept my invitation to a new friend. You are a modern day Peace Pilgrim! I did not get to meet you, but your picture was posted in my town newspaper, the Ramona Sentinel. Your experience makes me so grateful for every moment that I have with my children and family. As imperfect as it is, we still have each other, and every moment we have the opportunity to love each other to the best of our ability. Your work is so important. Please continue to do what you do and be who you are. You are a gift to the world! I had the pleasure of meeting Steve today in San Bernardino, CA. Although i didn’t have a full conversation with him, reading his story brings me tears for his losses but opened my eyes to keep looking ahead & to enjoy life while i can. It was certainly a great experience meeting Steve Fugate today. I was driving down 60 in florida and saw a man walking down the road pulling a cart and a large sign saying LOVE LIFE. This was months ago and never forgot that sign. Now today I see the same man on yahoo and can’t believe the story. Truly amazing and I wish him all the happiness in the world. I’m speechless…. Sir, you are an angel. I recently lost my wife of 25 years and there is no way to express the devastation. I feel for you and admire you at the same time. If you are ever in Fayette,AL you have a place to stay and rest up. I lost my 5 year old granddaughter 7 years ago, my Mom 3 years ago and my 58 year old sister 2 years ago. I was depressed and had my share of tears, but, I drew the strength that I needed from reading the NIV new testament. I accepted Christ as my Savior and I’ve put my trust in Jesus. Hello there. My name is Drew Mikesell. I was that tall, lanky, blonde-haired guy cleaning rooms at the Super 8 in Menomonie, WI. It was a pleasure chatting with you about the weather and what not, also I’d like to thank you for the 5$ tip you left me. Hopefully, that kindness will be paid tenfold towards you good sir. I hope your adventures are safe and pleasant. Love this, LoveLife. And, by the way, Chosen Hiker (on Facebook) is walking the whole North Country Trail to honor her daughter who died a couple of years ago.